Tonight the family decided to save a few dollars and stay in rather than go out to eat. As part of the evening we decided to watch a movie with Alyce after we put Luke to bed. 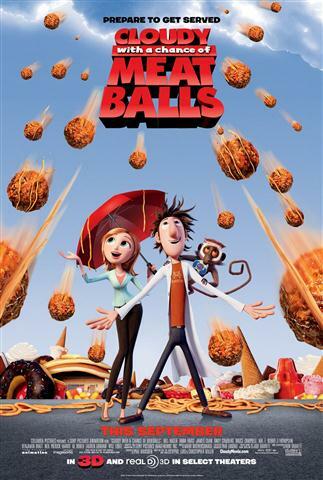 The movie we watched was Cloudy With a Chance of Meatballs. The movie was pretty good and Alyce seemed to be enjoying herself up until the end. Then a combination of peril in the movie and her being overtired put Alyce in tears. She was worried about what was going to happen to the main character. We tried to reassure her that everything was going to be ok but it took until the of the movie for her to be convinced. Following the movie it was close to 9:45 and Alyce was so tired that she couldn't keep herself together and the smallest infraction would lead to tears. Luckily I coaxed her into to bed and was able to cut off her ramblings so she'd finally roll over and go to sleep. Maybe we shouldn't have let her stay up that late. Next time we'll get the movie started earlier and with a bit less peril. 0 comments on "So Maybe This Wasn't a Good Idea"